The bog was formerly raised and turf was cut away by hand until the 1920's, after which it was left undisturbed. It is likely that most of the acid peat was removed to reveal alkaline peat, upon which fen vegetation has regenerated under the influence of groundwater. In 1999, 'The Irish Peatlands Association' (IPCC) in association with a Local Action Group 'Móin Fhionnúrach Development Association' (MFDA) purchased the Bog with a view to Study, Conservation and bringing the area to the appreciation of visitors and the general public. As a first step in developing a management plan for the fen, a vegetation survey was undertaken- this found one hundred and eighteen flora and one hundred and ten fauna species, the Orange Tip Butterfly (for the first time in ten years), nine vegetation types including Wet herb vegetation, Tussock vegetation, Acid bog vegetation, Bramble vegetation, Fen carr woodland, Drainage ditch vegetation, Gorse vegetation, Swamp grassland vegetation and pasture. On the basis of this report, the Department of the Environment and Local Government declared Fenor Bog a National Nature Reserve, Natural Heritage Area No. 1697, in 2004. Fenor Bog consists of 32 Acres/ 13 Hectares, lies 30m above sea level and is surrounded by low hills including Ballyscanlon Hill which stands at 122m above sea level. A number of recorded monuments of archaeological interest occur within the vicinity of the bog including earthworks, ring forts, a standing stone and tomb. The site identified for the location of the Visitor Centre lies to the west of the Bog, on an area currently inhabited by Gorse which has excellent views over the surrounding countryside- Northeast views to Ballyscanlon Hill and Conifer plantation, distant Northwest views to the Comeragh Mountains, views back towards Fenor Church through mature Cedar Trees to the Southwest and views over Fenor Bog itself to the East. Access to the Bog is currently through the carpark which it shares with the Church, separate pedestrian access from the road is also accommodated- both of which lead to a 500m long recycled lumber boardwalk, erected by MFDA through various funding groups and efforts, which facilitates access around the bog. The predominant prevailing South-Westerly wind leads to exposed condition on the bog itself; however the adjacent site is somewhat sheltered to the Church and Cedar Trees. The main Design challenge on this site is to take full advantage of the excellent views, allow full appreciation and understanding of Fenor Bog and respond sensitively to its setting and ecology, while also facilitating access and connection to the Bog itself. 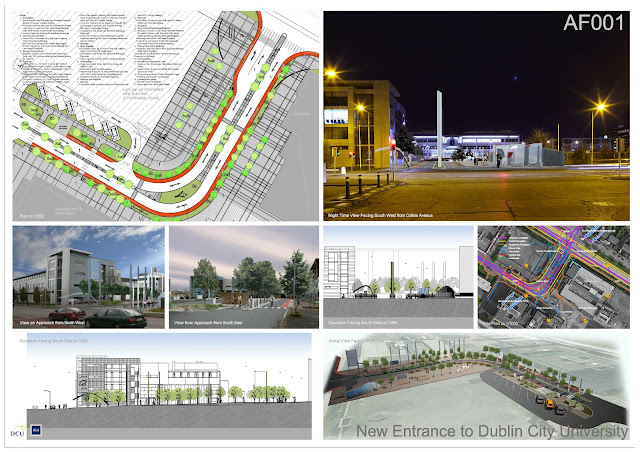 Aligning the main circulation route, a continuation of the existing elevated walkway, with the central axis of the site provides the benefit of reducing level changes for access by all and the same sensitivity employed on the existing walkway allowing continuation of plant growth beneath. 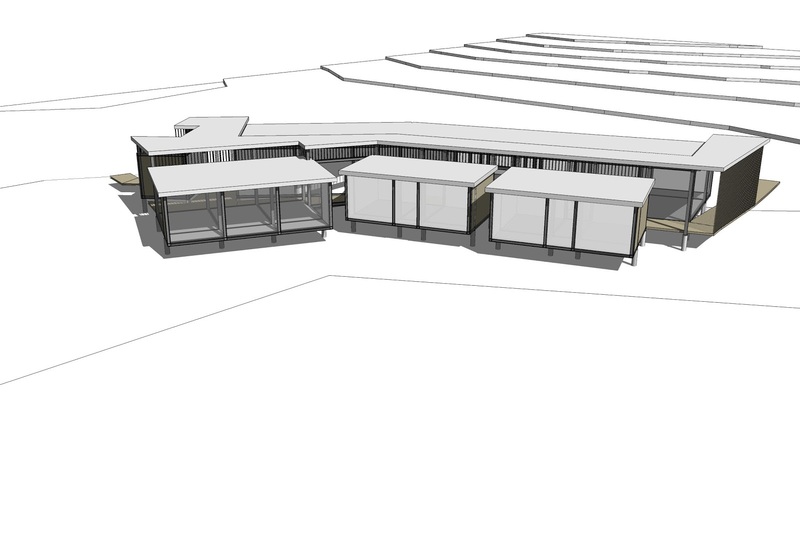 Similarly, elevating the main building accommodation to this level acts sensitively with the added advantage of maximum views over the existing visual obstacles of a raised earth bank to the east and low lying gorse vegetation throughout the site. The arrangement of the Centre's required accommodation to either side of the main circulation route in separated settlement pattern rather than one continuous block is appropriate to the context and existing settlement patterns of Fenor village, ensuring an appropriate scale and massing. The existing Fenor Church is comparable in size to the exhibition area of the Centre. Further separation and layering of overall mass is achieved through three separate roof planes, the highest providing rain and sun protection to the central walkway, a lower plane for the Exhibition and Audio Visual/ Lecture Area and the lowest plane appropriate to the more domestic function of Staff Offices and Accommodation and Visitor Facilities. This layering of planes also reflects the original function of the Bog, Turf cutting, where the fossil fuel was cut by hand revealing layers. This separation of both planes and mass also allows ventilation to the semi-external walkway, external access to the walkway for staff and incidental views from the walkway for visitors. The location and alignment of the accommodation has been carefully considered, both to align each separate block with a significant view but also a view appropriate to its function. 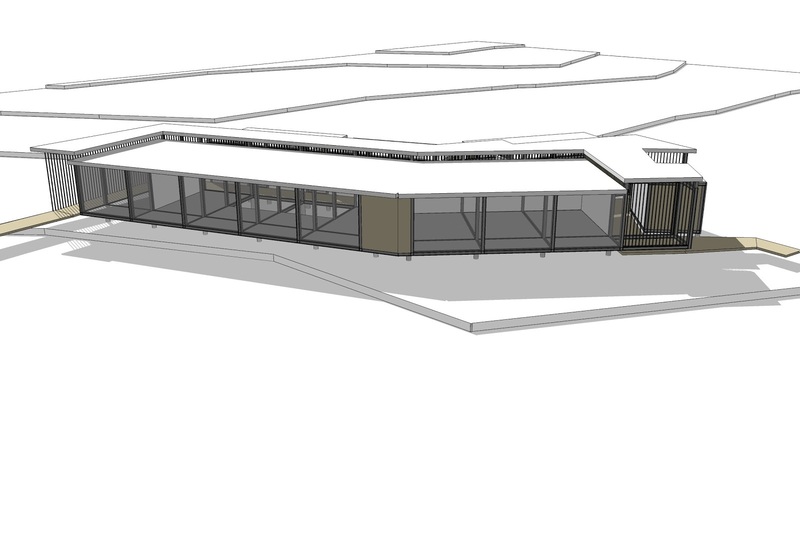 The Main Exhibition area has been aligned to views over Fenor Bog itself, the Audio Visual/ Lecture Space has been aligned to a more distant but fuller field view of Ballyscanlon Hill, the Offices aligned to a more reflective and quieter area facing back to Fenor Church while finally the Seating and Dining Area can appreciate framed distant views to the Comeragh Mountains. 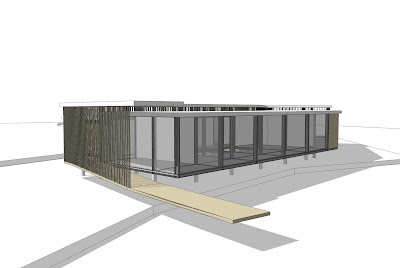 Transparency and reduced visual impact is achieved through the larch timber 'veil' and screening. The difficulties associated with interpretation and display of a Bog Land environment can prove challenging in the context of an exhibition area. Whereas the prominent fauna and flora can currently be easily identified on the existing walk Bog Walk, the sighting and identification of many other varieties can prove more difficult. The Centre deals with this through the introduction of a central 'live' exhibit, a void open to the element and rooted in the existing soil. With this void, selected flora can be transplanted from the Bog area for convenient identification, study and appreciation of staff and visitors alike. 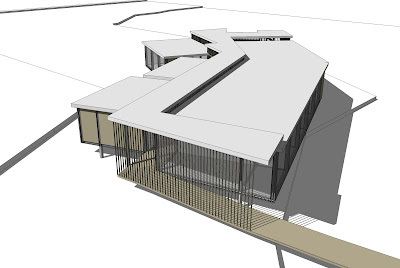 Further connection of the Centre to its site is achieved through the constructed reed bed area at the Main Entrance, where breeding and habitation of Dragonfly and Butterfly are encouraged. 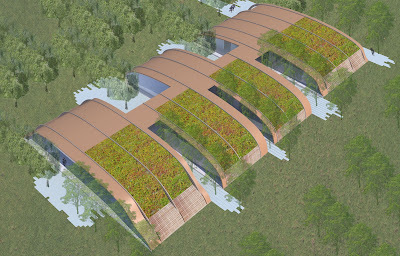 An extensive Green roof planted with local flora, adding a further area to promote and conserve ecology. 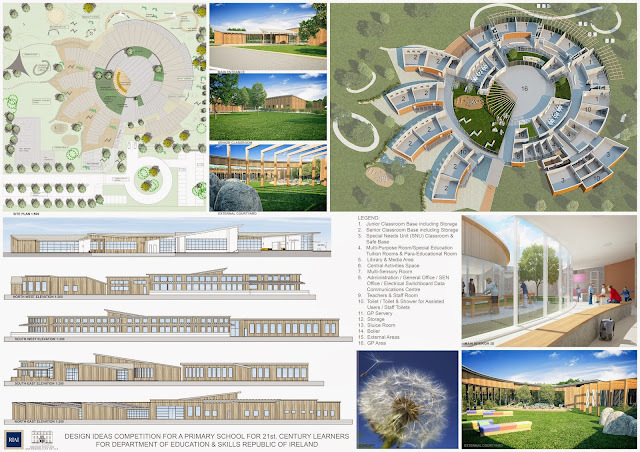 The Construction Material and Method employed on the Centre also reduce the overall impact of initial construction works on this sensitive site. Efficient and Economical offsite Construction methods are facilitated through Steel Framed Pods with Larch Cladding and Glazing. Once initial piling and elevated walkway works have been completed, these Pods can be craned into position from the existing carpark, minimising disturbance to the ground and reducing the possibility of contamination from Construction. Whereas the existing carpark currently facilitates access, improvements to the facilities and access provided can encourage additional visitors to travel by foot, bicycle or electric car with a charging point installed. 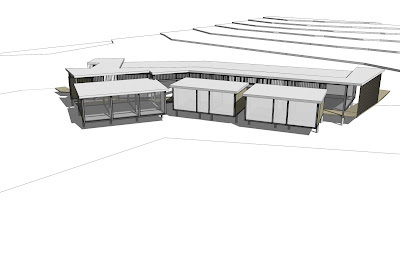 The treatment of foul water from the building is dealt with through a raised bed treatment plant, discharging into a percolation area in the adjoining agricultural land, away from Fenor Bog.